We often pass through moments in life when we are surrounded by variegated personas with dimming levels of optimism who are sprinting without a finish line in sight. Then sets in motion, a chaotic journey which is no less than a turbulent roller coaster ride that you badly want to get off but cannot as you are unable to signal to the suddenly inconspicuous roller-operator. 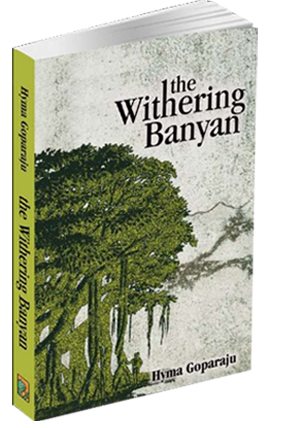 My first novel, ‘The Withering Banyan’, is fictional, though I have taken the liberty to borrow a few incidents from the happenings around me while I was growing up – to illustrate the fickleness of the drama of life and its characters – as they enter and leave the panorama of creation and existence. The fluidity of the human mind, its unsurpassable boundaries and the chequered paths it loves to travel in its utmost unbridled, incoherent and yet seemingly regular journey; thrashing and battering relationships on its way, has intrigued me often. So I finally gave in to my yearning to pen it down in the form of a story. In the words of F. Scott Fitzgerald, You don’t write because you want to say something. You write because you have something to say. And as the novel wove itself through the intricacies of the story line, it is now before you for a read and appraisal. facebook page, which I invite you to join. P.S. The Withering Banyan was shortlisted for the second round of the Amazon Breakthrough Novel Award (ABNA) Contest 2014 in the General Fiction Category.